A place for cyclists to deliberate on the meaning of it all! It's an intoxicating feeling. At around 6am I set out, bike lights flickering in the still-dark morning air. This is the coolest it ever gets around here in the tropical humidity of Malaysia, so the obvious lack of unassisted visibility notwithstanding, it's a very nice time to be out on the roads. The delirious moment is in the contemplation of the agenda ahead: I have all day. I'm carrying everything I might need, and quite literally, the world is my oyster. It's quite normal for me to do over 200 kilometers on a day like this, and the fact that I'm quite happy doing it on my own seems to surprise a lot of people. Somewhere along the line I suppose it might have evolved as a result of my athletic history: much of my cycling in the past was in training for Ironman triathlons - and since that type of racing constitutes a quintessentially solitary effort, which requires specific, solitary training, I just got used to doing it on my own. Add the fact that as someone who often worked late nights, my rides were at times of day when most others were working - or avoiding the heat. And it is hot here. That's another factor. I somehow suffer less in the heat than many of my friends, so I'm quite happy being out under the midday sun when most local cyclists are safely back in their air-conditioning. And so being out from dawn to dusk doesn't really present any additional issue for consideration. Good sun block on arms and legs. And I wear a cap under the helmet to give sun protection to the forehead and nose - sunblock on the face always ends up in my eyes. The final deciding factor though has to be my ability to keep going happily and indefinitely on water and not much else. This makes preparing for a ride a breeze, where the only difference between preparing a short and long ride is the size of the bottles, how many spare tubes I carry, and the amount of cash in my back pocket. It means I stop less during the ride, since my first couple of bottles can last me 100km, and I eat only when my appetite demands it, and even then I rarely stop for long. Since I adapted my body, almost 3 years ago now, to ketosis via a low-carb-high-fat diet, I no longer seem to have any limit to how long I can keep going. I don't experience fluctuation in my energy levels, and have entirely forgotten that fear of hitting the dreaded "wall" of glycogen depletion. In a body adapted to burn its stored supply of fat, instead of sugar, I seem to be able to operate indefinitely within 70-90% of my threshold without really running out of reserves. I will get hungry, but there's no "wall" to hit. Hunger is just that: I feel like eating. It's a massive advantage. No doubt it's a major factor in opening up this world of possibilities, but why do these possibilities even interest me? "Where does the desire to be out all day on a bike come from?" you might ask. Now that's a good one. I will have a stab at analysing it. In a previous post "The Poetry of Cycling", I suggested that those of us who discover cycling as children as part of our exploration of the world around us, never quite lose the sense of freedom associated with the humble bicycle. It's an empowerment. There's enormous satisfaction for us in getting ourselves somewhere else propelled entirely by our own forces. It's a feeling of self-sufficiency. Maybe it's a residual genetic imprint of our persistence-hunter forefathers and their nomadic lifestyle. Keep moving to survive. Then there's the sense of discovery and adventure added once you're onto new roads towards new destinations. This in itself is possible with many forms of transport, but as an additive to this self-sufficiency, it's even more special. There's a kind of intimacy with the environment, which is only possible on a bicycle, with nothing more than the sound of your breathing to disturb the peace, and every element of the world around you tangible to your senses, you form an integral part of the world as you move through it. Then of course there's the obvious sense of achievement. To be doing distances routinely that you once considered seriously challenging can become quite addictive. This is just inevitably going to lead to ever longer, higher, harder rides. I relish the lightest possible load when I'm doing this. The art for me is to get everything down to the purely essential. I'm always looking for the smallest and lightest way of carrying only precisely what I can't do without on a ride like this. You might one day see me heavily laden with panniers etc as I embark on a round-the-world or trans-continental ride, but for my current plans of rides lasting no more than a few days, I'll carry everything I can in my pockets and a saddlebag. You see, I also want to be reasonably fast, and not too severely handicapped when it comes to my favourite terrain: the hills. So I'm fully-kitted-out for the bike, and only minimally prepared for the time off it. 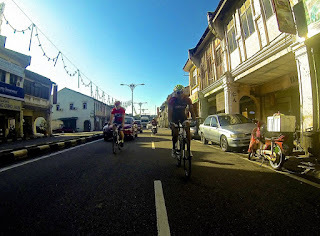 On rides in Malaysia - where keeping warm is never an issue - the only extra clothes I will carry if I'm staying overnight somewhere, is a t shirt and a pair of shorts. Assisted by the new high-tech fabrics by sportswear companies that pack away into tiny spaces, these will take up very little space. I won't carry extra footwear since the budget hotels available in most towns provide flip-flops in the bathroom, which they don't mind you wearing to wander around. And if not, I would rather spend a few ringgit on a pair of flip-flops than carry these things with me. So then the only additional thing in the "luggage" is a single charger for gadgets with 2 cables for the different plug types of my phone and my GPS. If I intend to do a lot of riding in the dark I would invest in some AA-battery-powered lights, as carrying additional charging capacity for rechargeable lights would be more trouble than it's worth. I'm doing an Audax race of 600 kilometers later this month, so I'm looking around at those light options now. That will probably mean riding through one whole night as I don't intend on stopping for long, but I'll see how my body feels. I'll find somewhere to sleep if I need it. That is a story you'll hear more about here. It's not something I've done any specific preparation for, and my longest single ride so far was around 10 hours, but I'm quite sure I can do it. It's just a long ride after all. Saxophonist, Composer, Cyclist, Ironman. There's some advantage to having spent your whole life outside the box. I have become a blogger in the hope of sharing some of it.